He knew he was dreaming; there was a part of him that was separate, watching from the sidelines as the young boy sat beside the fireplace opening the present from his parents then looking up at them, his eyes wide with delight. 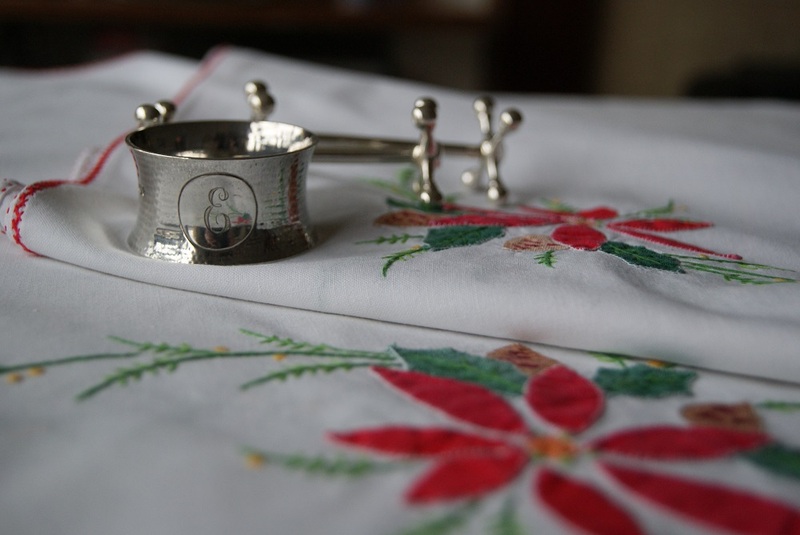 He saw the young officer polishing the silver napkin rings at the table, his elderly parents sitting beside him, chatting about work and friends, delighted to have him home for the holidays. He was there in the car as the Rolls swerved, and he saw Straker risking his own life, taking those precious few seconds to lunge forward, grabbing Henderson’s wrist and dragging him from the car. He flinched as he saw himself hit the ground, rolling over and over, coughing blood before recovering enough to look around in fear. He saw Straker crawl over to Henderson, unconscious and yet alive, saw the car a burning wreck at the bottom of the hill. He stood beside him in the security chamber in New York, and was there as he entered the room to sit at the head of the table while the world’s most influential men prepared to interrogate him. He was watching as Straker walked through the half-built control room, clambering over wires and cables, avoiding the consoles that were in the process of being installed, and through to the empty office, no desk yet, no furniture at all. He listened to the argument with Alec Freeman. He was in the car with Straker on the way home to Mary, was at his side in the hospital, waved his own unseen greeting to the baby in the small cot, sat in the vintage fire engine beside John, was at the edge of the road when the car came round the corner, in Paul’s apartment, when they found the evidence. 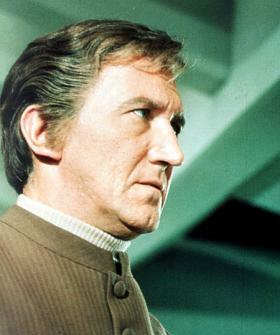 He looked on as Craig floated away into space and Straker clung to the handhold on the outside of SID. He was there, cheering silently, when Straker slammed the rock against the wall, and he strode beside Straker down the path, away from Catherine’s body, Lake hurrying after in a futile effort to be of some comfort. He was there. Through the joys and the pain and the loss. 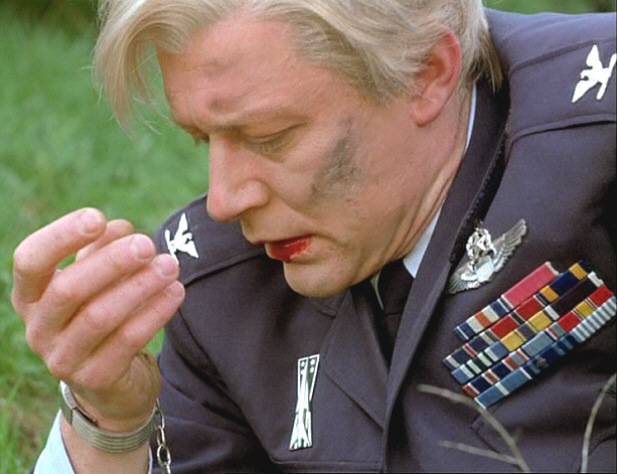 And then Straker turned round and saw him. And held out his hand. He grasped it in his own fingers, staring into his own eyes. Then there was only one. Only himself – Ed Straker – alone in the dark, but this was not the darkness of fear and death and that other world. This was just night-time, a much needed respite between one day and the next, a time of rest and recuperation, nothing more sinister than that. He allowed himself to relax for a moment before a surge jolted through him, as if the world had moved around, settling into a new position and then shuffling to get comfortable. He took a deep breath, feeling as if he had slept for hours. It was a long time since he had felt so refreshed by sleep. There was a distant sound, and a blaze of light that came closer, blinding him for a moment. A car driving past them; the first one since he had stopped here – how long ago? Hours? There was no way to tell. He kept still, aware that she was still there, pressed against him. He could have stayed there all night, holding her and being held, but in the end he bent down to kiss the top of her head. Not a lover’s kiss. A kiss of gratitude. He could never love this girl, he feared her too much, but he owed her more than he would ever be able to repay. His life, his future, his world. She stirred and lifted her head to look up at him, before moving back. ‘Time for me to go,’ she said and opened the car door, yawning. The street light was still flickering and he saw that the dashboard clock hadn’t changed. 20:59. He didn’t waste the effort in wondering. This night had been full of surprises. ‘Will you be all right?’ The question was foolish; he knew the answer already. ‘I won’t.’ There was not much more he could say to her. He didn’t dare say much anyway. The door slammed, the street light went out for a brief moment and when it came back it was no longer flickering. He craned forward, but there was no sign of the girl. He was not worried, he knew she would be safe. The cold air had chilled the car and he shivered, then remembered his coat. She was still wearing it. Nothing he could do about that, and anyway, it was just a coat. He could get another, next week. He rubbed his hands together to warm them and then, with a sigh, started the engine. The numerals changed. 21:00. Still Christmas Eve. Time enough to drive home, have that early night and then, in the morning, finish wrapping parcels and writing cards. He could deliver most of them on his way to Headquarters before spending a couple of hours at work, maybe even join the staff for a few minutes before the lunch break. It was too late to accept Alec’s invitation, but there would be other years, other Christmases. In the future. The pub at the crossroads was emptying, last orders called, boisterous drinkers spilling out into the night in groups heading for waiting taxis. He stopped for a moment and imagined it as he had seen it in that other world. Boarded up, abandoned. A world too afraid of the enemy to dare venture out for an evening with friends. He let the handbrake out and moved forward, but then slammed to a halt as a group of women staggered across the road right in front of the car, tipsy and giggling and harmless, wearing Santa Claus hats and making their way home to waiting families and boyfriends. Time for him to get moving as well, but there was no need to rush. The drunks were out in force, and he had no wish to run someone over; he had seen enough people hurt tonight. He was aware of the need to drive with care and not just because the police were out in force. Her words echoed in his ears as he drove home. ‘This world needs you.’ He had a second chance and he was not going to waste it. Gravel crunched beneath the tyres and he parked the car, sitting behind the wheel for a minute, loathe to break the silence. He could see the street lights nearby and the porch light from his nearest neighbour. Home. It was past nine o’clock now, though he checked his watch just to make sure, and he closed the car door with a soft clunk, looking up at the swathe of stars in the Christmas sky before heading inside. The pile of letters and Christmas cards behind the door could wait until morning. He tossed his jacket on the back of the sofa, heaved a sigh of relief and, without any hesitation, poured himself a brandy. He took a small sip, relishing the warmth in his throat and held the glass in his hand for a moment, thinking, before he put it down on the table and headed upstairs. A very quick shower, a shave, changing into casual trousers and shirt, and he was out again in less than ten minutes. The car was still warm. The Studio reception area was bright with Christmas lights and a decorated tree. Sunk in his misery he hadn’t noticed it when he left earlier, but now he stood back, admiring the effect before walking down the corridor to Miss Ealand’s office. It was empty, as he expected, but that made no difference; the senior access to SHADO operated twenty-four hours a day. He waited by the door as the elevator descended, feeling a little uneasy and not sure how his presence would be greeted. Alec had been curt earlier. But it was merited. After all, he’d behaved like an idiot, rushing off like that and getting himself into such a state. A shiver ran through him as he recalled his wish. He had no idea who the girl was, or what she was and, in some respects, he had no desire to find out. She had opened his eyes to his selfishness and without her intervention he might not be here today. His headlong drive into the darkness would have ended in death, maybe more than just his own death. But the overwhelming, and quite frankly, nauseous despair clouding his thoughts was gone. He looked at his watch again. A quarter to ten. So much had happened in the last hour to make him reassess his life. Oh there was still the loneliness, the aching sense of loss, but he was needed here and it was that knowledge that made the emptiness bearable. He shook his head, the door slid open and he stepped out, for once hesitant in these familiar surroundings. A rush of memories: the wreckage of the Control room in that other SHADO, so many deaths, so much destruction. He found himself heading with brisk steps towards ‘his’ control room, ignoring the laughter and music and a distinctive sound in the distance. Henderson’s unmistakeable voice and the sound of heavy footsteps approaching. He stopped as the General came round the corner. ‘Catch you later Ed. Good to see you.’ Henderson headed off towards the men’s cloakroom, and Alec held out his hand. Forgiveness? They both laughed and he stepped aside to let Alec go through the doorway first, slipping behind him and trying not to make an obvious entrance. The lounge was filling up and it was easy to make his way, unseen, over to a quieter corner of the room, picking up a glass on the way, and then standing there, watching the rest of the crowd. These were his people, and he realised that he was at home with them, as comfortable and relaxed as if they were his family. And in many respects they were. There was no need to feel lonely here; he was surrounded by friends, even if he was by himself. Ford wandered over to get a glass of ‘something drinkable’ as he put it, and they spent a few minutes trying to work out the ingredients of Alec’s punch, both agreeing that perhaps it was better not to know. Miss Ealand offered him mince pies and tiny home-made pastries, wished him a merry Christmas and, blushing somewhat, gave him a peck on the cheek. He realised with surprise, that he was enjoying himself. There were things he needed to say to Henderson later. Not tonight though. It could wait. Inconsequential things yet important. A good man, James. They needed to work together in the future instead of being on edge all the time and bickering about finances. And tomorrow he would find a quiet moment and talk to Alec. Maybe even get there early and tell him about tonight. He finished his drink, and went to get a fresh one. The room was busier now, couples talking in corners, holding hands, discreet kisses. The music slowed, Alec and his girlfriend heading onto the dance floor with all the other couples for a slow waltz. Straker closed his eyes for a moment, put down his untouched glass and headed outside. Time for some fresh air, while everyone else was busy. The lights on the tree twinkled at him as he walked into the Reception area and listened as music drifted across the empty space. This was the hardest moment, the ache to hold someone in his arms, to dance with a woman close to him. There was a brief touch on his hand and he flinched, remembering other flickering lights, other fingers on his wrist and then, he turned around. She was the last person he expected to see here, smiling, her hands held out for him to grasp. He had no idea how she came to be here tonight, but he needed someone to hold and someone to hold him. He needed her. He hoped she needed him. He was not aware of the door opening, or the sound of footsteps as Alec, unseen in the shadows at the perimeter, came searching. He was only aware of hands pulling him closer, of the warmth of her skin as he bent to murmur in her ear, and Nina lifting her face to meet his. A lover’s kiss, stolen in the shadows, no-one watching them now, as Alec crept away, leaving them in peace. And all was well with the world. This entry was posted in UFO Stand Alone and tagged angst, Christmas Eve, death, One WIsh, paranormal, Straker by Ltcdr. Bookmark the permalink.